Seminar on "Competency Framework for HR Generalist"
Extensive research confirms that people want to grow and develop in the roles. They want to feel valued and appreciated by their leaders, and to know their work has significance. And, just as Abraham Maslow predicted 70 years ago, they seek to feel fulfilled and even maximized by the work they do. Workplace leadership is failing today largely because it has yet to acknowledge the importance of “emotional currency™” – a form of reward that makes people feel important, supported, valued, developed and appreciated. In fact, science now has proved that it’s our feelings and emotions that determine our level of engagement in life, what motivates us, and what we care most about. Mr. Zaidi is Training, Organization Development and HR specialist having more than 17 years’ experience in different industry. He is a Business Process Reengineering Consultant. He has exposure as KPI consultant at home and abroad. He has completed Masters in HRM under the University of Dhaka. He received World Training & Development Leadership Award in 2016. He is Member of KPI Institute Australia. He is a certified Lean Office Professional. He is a Professional International Member of Association for Talent Development [ATD, largest association for training & development worldwide], a member of Certified Professional Trainer Network [CPTN] - Canada & certified Trainer from City & Gild– UK. He is also member of American Management Association (AMA) and Society for Human Resource Management (SHRM) USA. He is also a Management Consultant accredited by Institute of Management Consultant Bangladesh. Mr. Zaidi attended as speakers in International Conferences in Singapore, India and Nepal. He also presented papers in different National and International Conferences. He is also guest faculty for leading Private Universities in Bangladesh. Mr. Zaidi has rendered Consultancy Service for Business Process Reengineering, Setting KPI, designing effective Performance Management System, Running Assessment Centre, Organization Restructuring, HR Audit, Process Development, Competency Mapping for Human Resources, Organization Development, for more than 30 organizations at home and abroad. He is an expert Performance Coach for different functions. He has conducted training in different countries including Singapore, Malaysia, India, Nepal, Bangladesh. He has conducted training in different organization on different soft and hard skill. He is an expert trainer in HR, Operational Excellence, Office Kaizen, Office ‘5 S’, Lean Office, Salesmanship, Organization Development, Organizational Leadership, Team Building, Change management, Negotiation, Customer Service and other soft skills. He has also exposures in Management Consulting. He did consultancy for more than 15 organizations regarding their HR & Compliance Audit. He also did management consultancy for organization restructuring and development, HR Auditing, HR Setup. He also runs Assessment Center for different organization. He is an HR Auditor and also a good motivational speaker. He worked on Training with renowned multinational, national, group of companies on different topics. He has contributed in the HR Development in the country through his research based studies, knowledge sharing sessions, analytical paper preparation, information based module and material preparation and sharing. He is now servicing in Power Grid Company of Bangladesh Ltd. as DGM-HR. He is the Secretary General of Professional Society for Bangladesh [PSB]. 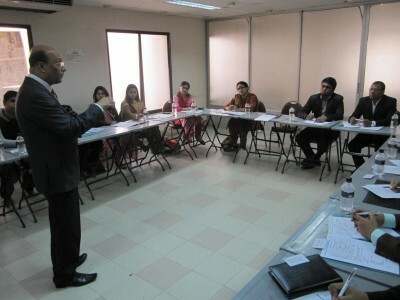 He is the fellow member of Bangladesh Society for Human Resources management [BSHRM], member of Worldwide Trainers Forum.